1. Winter addition play dough mats - 9 addition mats for adding 2-10. Students count the winter items and then repeat the number in the lower circle using manipulatives, counters, candy - anything! More advanced students can write in the number. 2. Build a snowman - Beginning Sounds - Students build their snowmen learning A - Z letter sounds. 3. Build a Snowman - Number Matching 1 - 10. Students learn to count and match numbers while building their snowmen. 4. 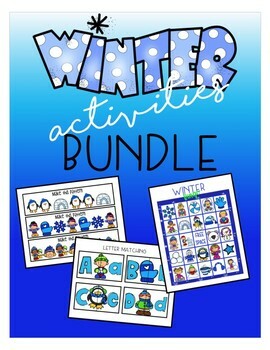 Winter alphabet letter matching puzzles A - Z: Students learn to match upper and lower case letters by matching the winter picture. 5. 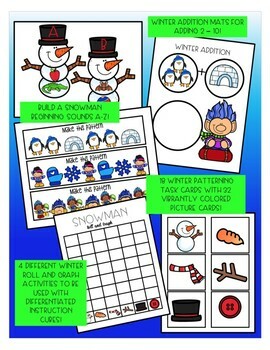 Winter - Make this pattern - 18 patterning task cards and 32 vibrantly colored picture cards are included. Students view the task card and then see if they can repeat the pattern using the picture cards provided. 6. 4 different winter roll and graph dice games - Insert the large picture cards into differentiated instruction cubes. Roll the dice and have the students graph what the dice landed on. 7. Snowman ABC game - Students help frosty get to the safety of the cold and snowy forest by racing from start to finish and learning their letters and sounds along the way. 8. Snowman button play dough Mats 1-10 - with counters provided. You can also use real buttons or have the students form buttons out of play dough too! 9. Snowman button counting activity - Students match the number of buttons on the snowmen to the number cards provided. 10. 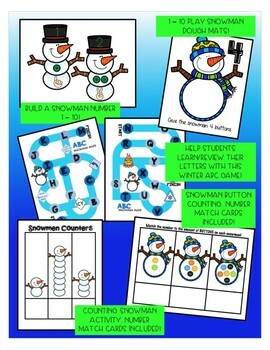 Snowman letter matching A - Z - This can be used like a find and cover (or slap the letter activity!). Put upper or lowercase letters into a sack. Have the students draw out a letter and see if they can find it's match. They can then cover the match or slap it! 11. Snowman roll and cover - Have students roll dice. Count the number of dots on the dice, find the number on the paper and cover it. 12. 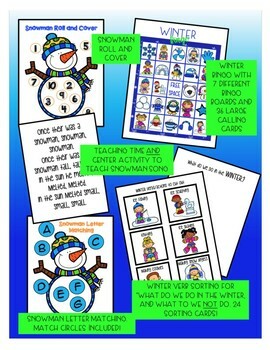 Snowman song activity - Included is the snowman song as well as a visual aid for teaching the song. You can then use the center activity provided to have student re-create the song in sequence by putting the picture cards in the correct order. 14. Winter actions sorting activity - Teaching students "what we wear in the winter" and "what we do NOT wear". Students sort through 12 winter clothes cards and 12 other seasons (spring and summer) and place the clothing in the correct group. 15. Winter verb sorting - Teaching students "What we DO in the winter" and "what do we NOT do." Students sort through 12 winter verb cards and 12 other season verb cards and place them in the correct group. 16. Winter bingo! 7 different bingo cards. I have also included 36 large and vibrantly colored calling cards. 17. 2 different winter number puzzles - both come in colored and black and white. Students learn to count to 10 by creating the puzzle. 18. Lets make 5 and 10 activity sheets - Students use two sums (like two different colors of snap cubes) to make either 5 or 10. 19. Hot chocolate one less, one more activity - Students learn counting as well as basic addition and subtraction in this activity. You can use the counters provided but mini marshmallows would be so fun too!